The PHCN-45, PHCN-47 and PHCN-48 model has been discontinued. Please see the CTXL Series as a possible alternative or contact our Flow Engineering department. 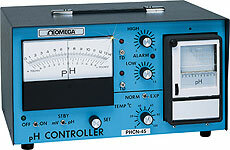 The PHCN-45 combines pH measurement, recording and controlling in a single compact unit. pH and millivolt readings are displayed on a 6" mirrored meter and the built-in chart recorder provides a 30 day record. In the standard mode, accuracies as great as ±0.05 pH and ±5 mV can be achieved. If increased accuracy is required, a 10X scale expansion is provided. Easy to use front panel controls can set both the high and low limits for pH control function to within 0.1 pH and activate a visual alarm when the limits are exceeded. If desired, an adjustable Time Delay Safety Feature will shut off power to the output if the pH does not return to the control point within set time (0-10 minutes). This can prevent over addition of neutralizing chemicals due to probe or meter malfunction. A pulsed 5 VDC alarm output is available to drive a DC solid state relay to indicate this condition. The PHCN-47 is a single electrode input model that combines the same functions as the PHCN-45 in a NEMA 12 type cabinet that may be used in a harsh environment. The PHCN-48 is identical to the PHCN-47 with a single exception: the PHCN-48 uses a dual electrode input that allows connection of one electrode to the meter/controller and the other to the recorder to allow real-time monitoring of the control system. In typical applications, the first electrode is placed in the input water flow where it senses pH and activates the control system. A second electrode located downstream drives the recorder to provide a continuous record of the pH of the effluent from the control system.